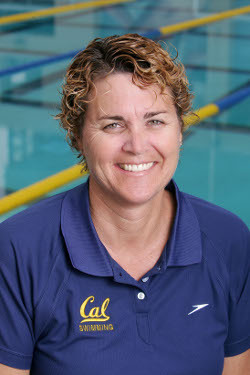 Teri McKeever, the University of California-Berkeley and 2012 U.S. Olympic women’s swimming head coach, received the United States Sports Academy’s 2011 C. Vivian Stringer Coaching Award. McKeever earned the prestigious award for leading the Cal women’s swim team to its second NCAA championship in three years and being named an Olympic swim coach for the London Games. McKeever was presented the award recently during halftime of a Cal men’s basketball game by Dave Maggard, who is the former Cal athletic director, a founding member of the Academy’s Board of Visitors and a previous recipient of the Carl Maddox Sport Management Award. You can view the award ceremony at http://www.youtube.com/watch?v=VDPpvNciyok. Now in her 19th year as head coach, McKeever has a long record of coaching success. She is widely regarded as one of the best swimming mentors today in the United States. She has earned recognition as an influential innovator in the sport because of her unique training methods and for turning unnoticed or burned-out swimmers into Olympians and world champions. The Academy’s C. Vivian Stringer Coaching Award is annually presented to someone like McKeever who has experienced outstanding achievement as a coach of women’s teams. In addition, the coaching award honors women who exhibit a high standard of propriety, imagination, and innovation as a character-builder in the tradition of great teacher-coaches. During her career at Cal, McKeever is a four-time Pacific 12 Conference Coach of the Year, and she earned National Coach of the Year honors twice for leading the Golden Bears to their first two NCAA titles in 2009 and 2011. McKeever became the first woman head coach to lead her swimming and diving team to a national championship. Under her leadership, Cal has produced two NCAA Swimmers of the Year and four Pac-12 Swimmers of the Year, and 15 consecutive top 10 NCAA finishes. McKeever has also experienced international success as a U.S. Olympic women’s swimming team coach. McKeever will lead the 2012 team in London, after serving as an assistant coach in the 2008 Summer Olympics in Beijing. McKeever was the first woman coach on the U.S. Olympic swimming team, after she also served as a U.S. assistant at the 2004 Athens Games. She was the first woman to be named head coach of the U.S. national team at a major international meet in 2006. Her current and former pupils at Cal include Olympians and world champions, such as Dana Vollmer, Haley Cope, Staciana Stitts, Sara Isakovic and Natalie Coughlin.